ALL FB Ads Revealed: Create THE Swipe File of the Century! — You Can Brand! Facebook announced it was going public with all of its advertiser's ad campaigns! 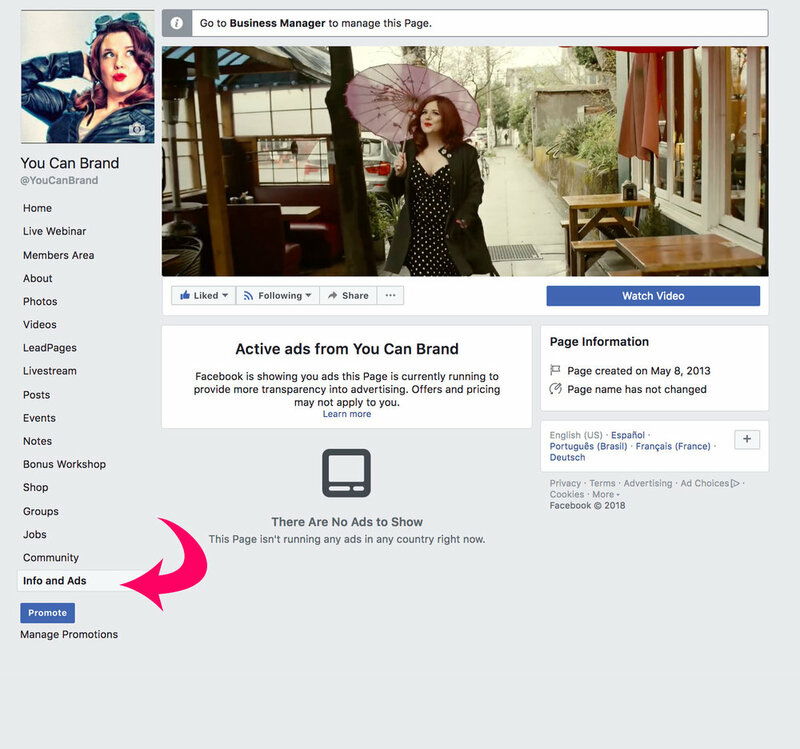 You can now see every influencer, industry leader, or business who is running Facebook / Instagram ads and see their: COPY, AD CREATIVE, and ESSENTIALLY SEE THEIR ENTIRE PAID ADVERTISING FUNNELS! WHAAAA??? Gone are the days of top advertisers ads being under a cloak and dagger, hiding in secrecy, only if you were lucky enough to be targeted by one of your peers/competitors/mentors would you be able to see their Facebook ad campaigns, and collecting them in their entirety funnel... it was near impossible unless they personally showed you! Step 2. Go to Biz Page: You click on "Ads & Info"
This is on the left-hand side of ANY business page. If it's a "WATCH" page with a video channel their Ads & info page is hidden in the THREE little dots on the far right-hand part of the page. Step 3: You can look to see which ads are currently running. If they're currently running, they're either testing an ad or running it because it is making them money. Are they lead generating (TOP OF THE FUNNEL), or are they retargeting an audience? How will you know? Analyze are they introducing who they are, or are they talking to the audience as if they know them. "You were signed up for the webinar...and didn't come, catch the replay"<--- obvious retargeting..
"Course Closes Tonight!" <--- Retargeting a warm audience, versus cold. Multiple types of creatives for the same webinar could be targeted to either COLD or WARM or HOT Audiences... What I've discovered is usually if they're ads with the brand personality's / guru's face on them they could be going for warm here, otherwise, the face won't mean much to a super cold audience. Step 5: Make a list of the types of freebies, promotions they're doing. Are they doing a challenge? Are they doing a Quiz? Are they just running promos to a Webinar Landing Page? What is the thing that hooks you in? A Fact? Are they challenging a belief? Are they sharing a personal experience? What type of "call-to-action" are they requesting? Step 7: What type of Creative Did they use for the ad? Pro Video? FB LIve? Iphone Video? Graphic Ad? What type of creative did they create? A graphic ad: (Did it have an image of the guru, a cartoon, a cool pattern? What kind of fonts did they use) Did they do a video? If so what did they say in the video? Step 8: If they're running a replay ad / closing cart ad, watch their webinar and take notes/screenshots of the slides, look at their landing page, and their sales pages. This will download an entire page and put it into a PDF for you!... and download their sales pages for analysis... Do the same thing on their ads, so that way if the ads go down... you have them captured for future reference! Step 10: Dance you just created yourself the world's best swipe file! Check out my $1 Trial to Work with me! How to get inspired without "stealing"? One of my clients who was doing Facebook ads was getting mediocre results with their ads, looked at the ads of one of their competitors and discovered they were using an animation software & template that they actually owned. The client took the SAME footage they had in their ads that weren't converting, put it in the animation program, produced a video that had different copy, different videos but similar in style as it was a template and their profitability went from every $1 they were spending to only a $1.80 in return, within 24 hours they went to getting for every $1 they spent, $4 in sales!!!! This increase 4 x return from this ONE thing within 24 hours just from analyzing their most successful competitors ads! THINK OF THE POSSIBLITIES! They ALSO caught a different competitor stealing one of their headlines. So if they wanted to, they could report that to Facebook. This is the power of this being available! You never, I repeat NEVER steal anyone's headlines or copy -- word for word. This is not ethical, it will get you in trouble legally and make you some enemies in the industry! There are actually sensors in Facebook ads that if you have copy that is too similar, Facebook will actually warn you AND that person of your ad copy being too similar!!! So don't do it unless it's a general industry term/phrase. What types of things are they saying? What you can do is see how they reference something "FREE Training" vs. "FREE Webinar"-- How are they convincing the audience to buy from them? How much copy are they using? How are they using testimonials? What kind of technology are they using for their quizzes? Don't use the same style image, or the same pattern they're using, keep it on brand and original. You can get layout ideas. Example: Use a bold headline with a powerful image on a color background, that is inspiration... not copying. Here's the thing, you're not stealing by getting inspired, you're looking at the structure of something without doing things word for word. You don't want it to be too close aesthetically cause it can create confusion in the market place! Diff pics, diff colors, diff fonts... same layout, totally acceptable. Why is this awesome? You can see what multi-million dollar businesses in your industry are spending 10's of thousands of dollars on. You know when you see the same ADS day in and day out on their page, they're the ones that are actually converting. Umm Pioneers being the first to get arrows in their back? (sad for them.)... Also it means an advantage for you if you're not said pioneer. It also means you can see your competitors sales pages (even if you're not in their funnel), which often are only available for a limited time! To see them just click on the ad. If someone isn't using Deadline Funnel, you'll be able to look at the sales page whenever they're running and ad for it. You get the FULL picture of their funnels... what they're doing for cold traffic, for warm traffic for Instagram stories, their retargeting for webinars. Note the content of their videos! Now they're is some educated guessing on which audience is for which, but honestly you can figure it out. I was shocked to find one of my main competitors does not do checklists as a freebie at the top of her funnel. While looking at her ads I discovered she had 5 different creatives pointed towards ONE webinar. Based on my own experience, I know that the leads that have come from webinars are far more likely to convert than the cheaper leads gotten from checklists / resource PDF's... So I find this information fascinating to see what types of ads I should be doing, versus just going for the cheap leads. It was so helpful to decon/recon this as I create my own paid strategies, versus guessing, cause as we all know GUESSING is expensive!!! I will report later on how this worked! Did you love this lesson? Do you want more lessons that are even more in-depth than this. Check out $1 Trial to Work with Me!